In my previous post I wrote about my arrival to Dubai . I left this one thing off that post because I thought it is special so I didn’t want it to get lost with all the other things we did that first day. It was a very humid and hot day. I don’t know if I could ever live in Dubai. I believe I could live everywhere, but that weather is really wet. I can’t even explain how it feels, it is something you have to feel for yourself. After some time you get used to it aparently…people who live there told me that actually they wear jackets in winter. Their winter is like our summer. I got dressed up, I even did my hair! If you love doing your hair then you will hate Dubai 😀 I don’t really do my hair that often, but it was a special night so why not. Every night should be a special night right? 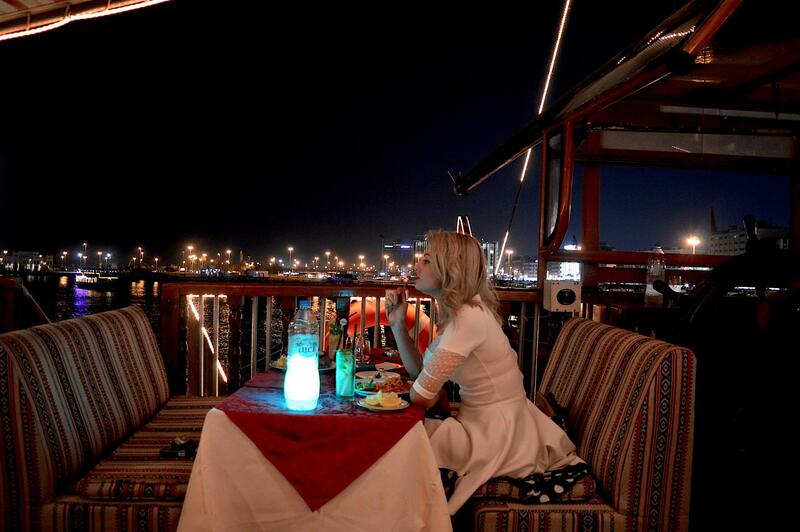 Radisson Blu in Deira Creek has its own moving restaurant. The boat is like a pirate ship. It has seating outside and cozy seats inside under the air-con. Of course sitting inside is no fun so we took a seat on top so we can have some nice views as we sail away downtown. I actually did not feel that hot on the boat as we had a nice breeze flowing. Shortly after we sat down we were served some drinks. Everything on the boat is fully inclusive just so you are aware. The dinner is a buffet dinner. You also get to enjoy a singer singing in Arabic for that extra feel. It’s really after I ate that I started feeling really hot. I think my body started digesting and I felt like I got a fever. At that same time the boat stopped moving so the breeze was gone as well, and I was just showered 😀 We started moving not long after that and got to enjoy the views of Dubai from a completely different perspective. It was magical! It was really an amazing experience. I was telling Charles before that I always wanted to do the boat + food thing so this was a really cool opportunity. I refreshed with some Mojitos before heading back to the hotel.